Nature can be unpredictable but wetland re-vegetation doesn't need to be...Wetland Sod consistently delivers re-vegetation success. Native plant seed germination constraints, hydrologic fluctuations, erosion, weed invasion and wildlife damage can make wetland plant establishment a costly challenge. Wetland Sod addresses these problems on the front-end so that back-end results are more predictable and cost-effective. At installation, Wetland Sod already has abundant, healthy shoots, roots and a protective coir matrix to immediately stabilize soils, crowd out weeds and resist nuisance wildlife damage. In addition mature plants mean greater resiliency to hydrologic fluctuations. The biodegradable coir mats are approximately 3" thick with a coir fill density of 6 pounds per square meter to provide immediate erosion control benefits. High plant survival and rapid spread rates ensure that plants take hold and provide long-term soil armoring. Wetland Sod's "soil less" medium safeguards against unintentional introduction of noxious or invasive weeds often hidden in the soil seed banks of other plant material treatments. Following installation Wetland Sod's mature plant community suppresses weed seed germination and sequesters resources to inhibit competition from encroaching weeds. Efficient sod-style installation can simplify and reduce labor costs for planting. Additionally, due to the relatively mature plants, Wetland Sod has less stringent requirements for topsoil or soil supplements. 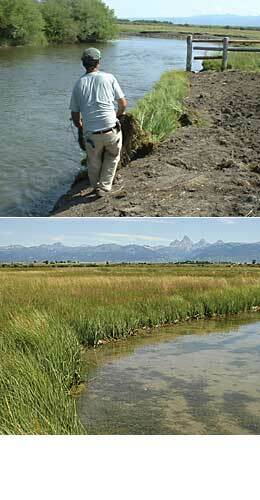 Many projects wait 2-5 years to attain the aesthetic quality of Wetland Sod after just one growing season. Rapid wetland plant establishment ensures functional and aesthetically pleasing results.